As somebody who became an anime fan thanks to a friend of mine (who works for Cartoon Network now) and because of Toonami back in 1996/1997..this is obviously heart warming news. 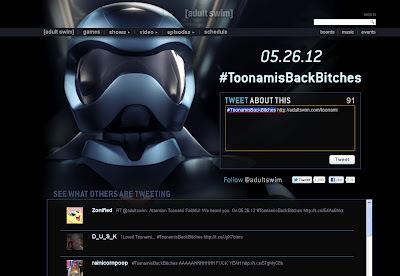 Apparently, the whole April Fools joke of playing Toonami on Saturday 4/1 and the twitter trends did in fact bring enough popularity for those over at William's Street and Cartoon Network to take notice. 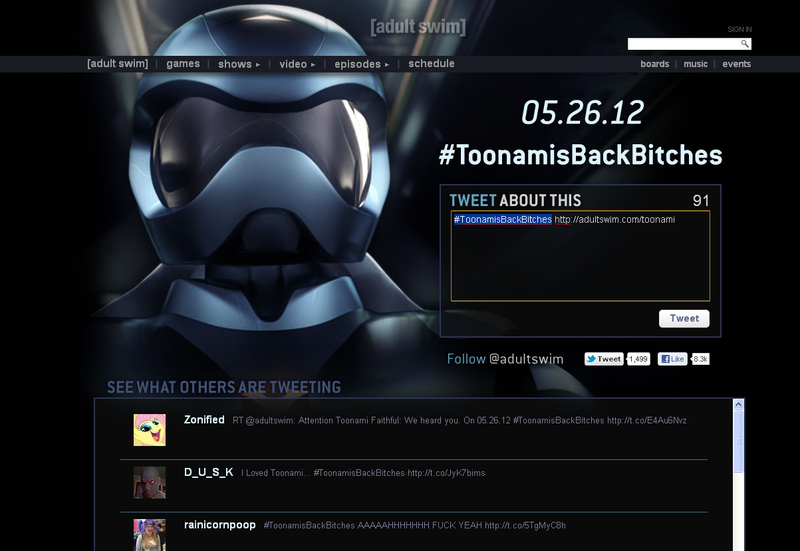 So, as announced today, on May 26th Toonami will officially be brought back from the grave. This isn't the first time the mainly anime savvy late night CN viewers brought back a show from the past cancellation. We all remember the rebirth of Family Guy thanks to Adult Swim viewers. Reason I stated "anime savvy" viewers is because at that time, Adult Swim was really just a newer version of Toonami's midnight run. It was us anime fans who brought Fam Guy back as well. Problem was, the popularity (and ratings) of Family Guy and it's revival brought in an entirely new and usually anime hating community. Adult Swim was riding strong on Inuyasha, DBZ and other shows at that time as anime in general was seeing a huge growth in the American market. Sadly, at around 2005-2006, the vast majority of the newer and more abundant viewership (and even some crew members at William Street) added to the growing anime hatred. Add that to the fact that anime piracy became rampant (thanks in part to anime studios being prejudice and still weary of non-japanese viewers/consumers)..the trend faded. Within this time, Adult Swim opted for cheaper, homemade and at times rather tacky/crappy original programming to pad around their main money maker, Family Guy...which then began just being newish repeats from FOX's reclaiming of everything Family Guy. By 2008, Toonami got cancelled and since then, anime got shoved into just Saturday nights where on a daily bases, the mouth-breathing basement dwellers who hate anime at Williams Street posted bumps that would poke fun at anime fans.... obviously not something one should do to the very viewership that was the reason for that block of programming to be there in the first place. Well, as they say, "Money talks and the rest walk." Twitter trends and more importantly virally rampant viewership means money to Cartoon Network. I ask you all, fellow anime fans to do what you can to make the revival of Toonami be as great as a return as Family Guy and Futurama was to TV. I know we have torrents, crunchyroll, hulu and netflix to get our anime fix now...but if we don't do something to bring back anime in at least a bit of positive limelight...then the anime deserter CEO from Tokyo Pop would be correct when he ditched the US a while back believing anime was dead in the US. It's not and Toonami can make people who weren't otaku (like me in 1996) become part of this awesome fandom. Make it so that anyone who talks bad about anime at adult swim eats their words when their bosses at CN headquarters would lose a valuable asset if canceled again.